A new policy will effectively prevent new students from joining a Greek organization before completing at least one full-time semester at USC. Beginning in fall 2018, new USC students will have to complete 12 units of classes before going through Greek recruitment, Vice President for Student Affairs Ainsley Carry announced Friday. The new rule also requires that students obtain a GPA of at least 2.5 at USC before rushing a sorority or fraternity. The change would effectively prevent new students from joining a Greek organization before completing at least one full-time semester at USC. Fall admits could rush in the spring, and spring admits could rush in the fall. 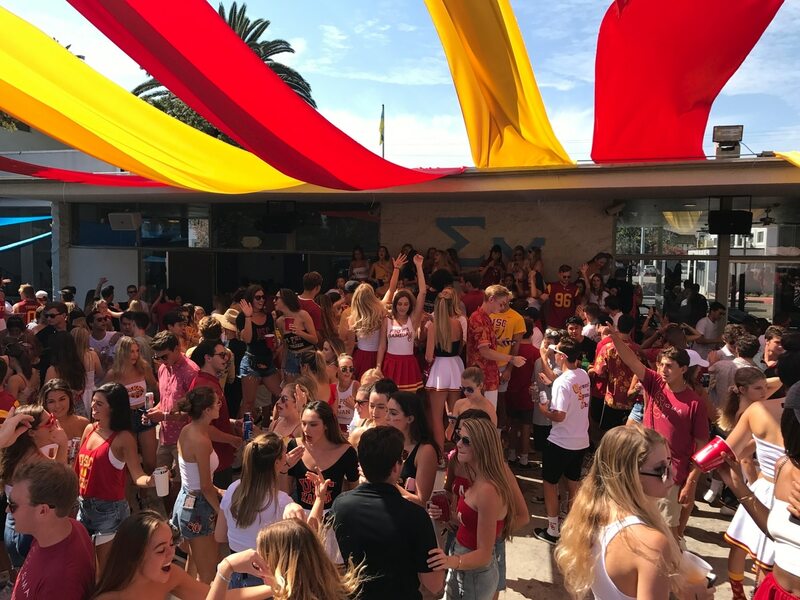 USC's fraternities and sororities have in the past focused most of their recruitment efforts on the fall semester, hosting events during what's known as "rush week." The organizations invite potential new members to attend and learn more about the values and culture of each individual chapter. The university hasn't fully determined how to implement the policy and is forming a task force with representatives from Greek organization leadership, Undergraduate Student Government, Residential Student Government, and the Office of Fraternity and Sorority Leadership. The group is slated to begin meeting in October and to work on implementation details. Carry said in a memo announcing the policy change that it is motivated by an interest in protecting students' well-being. The memo says, "This is the toughest year of the transition to college life as students experience the most social and academic challenges." 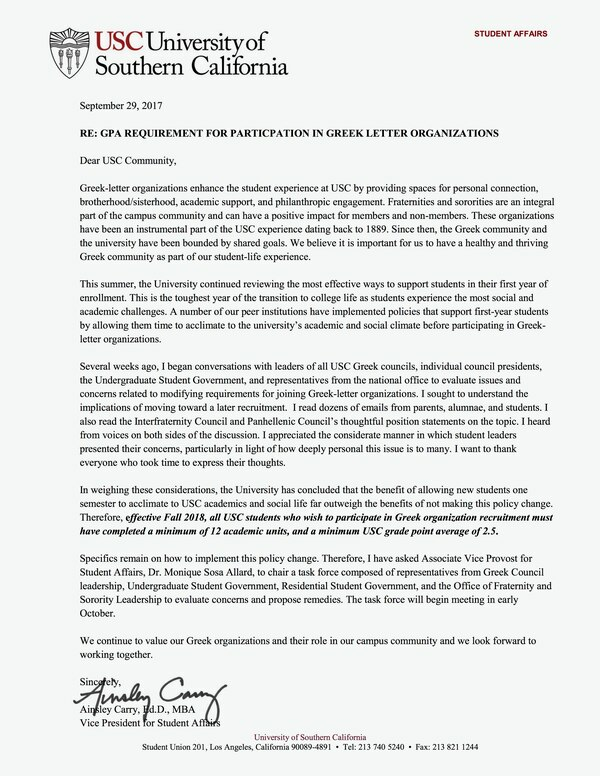 Carry says like other universities, USC wants to give new students "time to acclimate to the university's academic and social climate before participating in Greek-letter organizations." Vice President for Student Affairs Ainsley Carry announced new requirements to join a Greek organization on Friday. USC administrators considered making this change two years ago after the Academic Senate, which represents the university's faculty, passed a resolution calling for it. "Students may experience a high level of stress as they go through the selection process, and can feel rejected when they are not selected," the resolution said. "New students need time to explore all that the university has to offer … before they commit to any particular path." According to a statement issued by the Interfraternity Council last week, discussions at that time led fraternities and sororities to make changes to their recruitment process rather than actually move when recruitment takes place. The council said in last week's statement that furthering efforts to reform the new member process would be a better shift than moving recruitment. Five days later, the Panhellenic Council, which represents USC's sororities, echoed this sentiment in a statement, saying it was "committed to moving forward on our progress." Carry met with each council on the Row earlier this month, starting with the Panhellenic Council on Sept. 11 and then the Interfraternity Council on Sept. 13. In a statement issued Thursday night after reviewing the new policy, the Interfraternity Council said it was "disappointed" and felt that the policy was created "without input from student leaders, alumni or other key stakeholders." The council argued that USC should solicit input from its own students rather than looking to the policies of other universities for guidance and creating a "secret agenda." 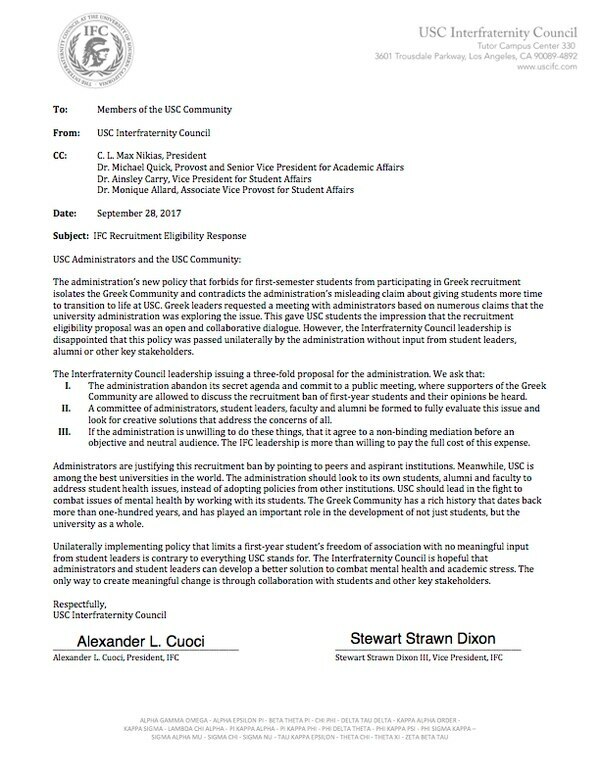 "Unilaterally implementing policy that limits a first-year student's freedom of association with no meaningful input from student leaders is contrary to everything USC stands for," the council wrote. The USC Interfraternity Council, which represents all its fraternities, issued a statement critical of the university’s proposed policy Thursday night. 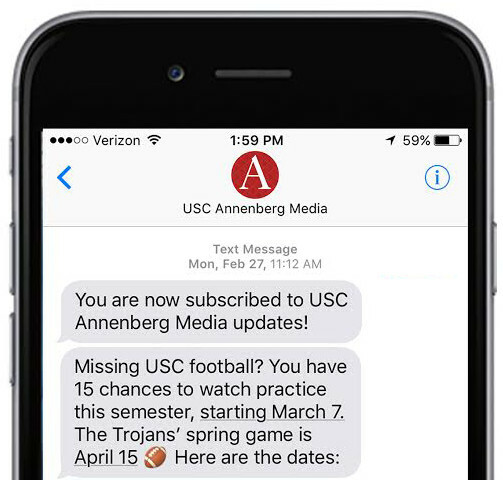 Carry reiterated in an interview with Annenberg Media this week that the policy change does not preclude a fall recruitment process, but it does prevent freshmen from joining a Greek organization as soon as they arrive. "There can still be a fall recruitment process," he said. "It's just not a recruitment process of 17- and 18-year-old kids who just left high school six weeks ago. We're asking that we give them a chance to get settled in, get plugged in, and in the spring semester recruit them and let them participate as much as possible." USC administrators are working on a proposal that would prevent new freshman students from joining a Greek organization their first semester. Here's why they're pursuing the change. In response to the policy change, the Interfraternity Council called for a public meeting with administrators and the Greek life community as well as the formation of a committee to find "creative solutions that address the concerns of all." If another solution can't be found, the council offered to pay for a mediation proceeding to work toward one. In his memo, Carry said that while crafting the new policy, he heard from the presidents of organizations on the Row, Undergraduate Student Government, national fraternity and sorority offices, parents, and alumni. Given all the input, he said the university concluded that "the benefit of allowing new students one semester to acclimate to USC academics and social life far outweigh the benefits of not making this policy change." Hey there! 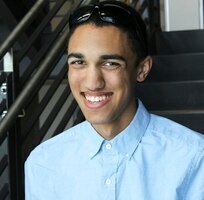 I'm a junior at USC and Annenberg Media's product manager, working to build the future of journalism. I’ve also worked as a digital production intern at azcentral and assistant city editor for the Daily Trojan. I’m passionate about helping journalism adapt to a digital- and mobile-first age with thoughtful products and user experiences.